From chic urban high-rise hotels to secluded palatial resorts, KYI has continued to produce elegantly designed and operationally successful developments throughout Asia and Southeast Asia. Varying in scale from a luxury 40-bungalow lodge to a 1,400-suite resort destination, KY International has dedicated many years of research and development to inherently understand the requirements and accurately foresee the future of resort and hotel design. Themed as “The Grand Palace”, the Marriott Putrajaya Hotel & Commercial Center stands majestically over soothing water features and lush tropical gardens. Spread over 12 acres of golf course front land, the Center is comprised of 500 hotel rooms and suites, and a 1,200-seat conference center. The 423 room 6-star hotel will be a destination for visitors, business travelers, and residents alike. The hotel’s amenities include a generous pool deck, pool and grotto, gondola drop-off, yacht dock, spa and fitness, ballroom and meeting rooms, and a water feature in every hotel wing. The 445-room hotel will be built along the shoreline, on a forested hillside overlooking the ocean allowing the resort unobstructed ocean views throughout. The resort hotel and villas, spa and convention center, combined with enduring architecture will quickly establish the Regal Palace as the preeminent resort experience in the region. The lush forests of Guangdong provide a tranquil backdrop for the private hot spring pools that every ground floor guestroom enjoys. The highlight feature of the resort is it’s expansive pool deck that includes a sprawling river pool, rock grotto, swimming pool with infinity edge, and over three dozen hot spring pools inset into the landscape and amongst various pavilions. 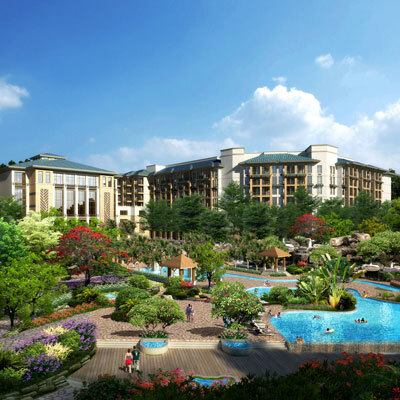 Set amongst the tranquil waters of a sprawling system of lagoons like the giant mythic sea-turtle that inspired the design, Weifang Binhai Resort will be home to a 299-room luxury hotel, ballroom complex, indoor spa, wedding chapel, garden maze, mini golf and gourmet restaurants. The resort will be the flagship resort of the De Rucci luxury lifestyle brand. The design is inspired by the grace and beauty of tropical Southeast Asian island architecture. The resort aspires to be the physical embodiment of good health, stress-free living and mindfulness through the masterful use of materials, color, details and planning. 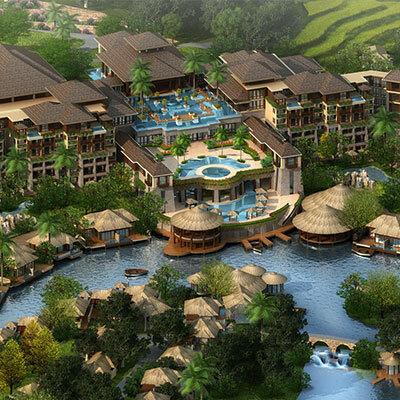 The resort will comprise a luxurious 300-room hotel with endless views. Resort villas tucked into lush landscaping, and a conference center. Carved into a lush hillside with the ocean at its doorstep, the Gold Coast Regal Palace Resort has an exceptional setting for a truly grand resort. A 5-star resort development that exudes a contemporary tropical grandeur indicative of the premier resort atmosphere of Sentosa island. The hotel will be an iconic landmark building along the Danga Bay waterfront offering guests scenic ocean views, specialty suites, and a 500-person ballroom. This international destination hotel will seamlessly integrate into the Bay Leaf complex, a fully realized and vibrant mixed-use development. A 3-star, 800 room hotel certified as the tallest hotel in Malaysia standing at 184 meters above ground. This massive, sprawling hotel resort has accommodations for over 3,700 guests and offers endless ocean views and lush garden courtyards intertwined with swimming pools, waterway and lagoons. A unique 5-star diamond resort nestled into the frested, ocean-front cliffs of Bali overlooking the turquoise waters of the Indian Ocean. Inspired by the Legendary Palace of Tirta Gangga in Karangesem, this unique Water Palace concept presents four-storey “low-rise villages” on islands surrounded by lakes and sand banks. The 750-room resort is spread out on 40 lush acres of serene lily ponds, waterfalls, rivers and carp filled lagoons. The Shilla Jeju resort is a 21-acre lush, landscaped cliff-top hotel located at the centre of the Jungman Resort Complex.